Exceptionally versatile, hardwearing and warm, the Arc'teryx Men's Thorium AR Jacket performs as a cold-weather mid layer or as a standalone. The jacket's design combines an ergonomic fit, quality craftsmanship and carefully selected fabrics. Lofty 750-fill European grey goose down delivers exceptional warmth for little weight, is durably resilient, and packs easily. 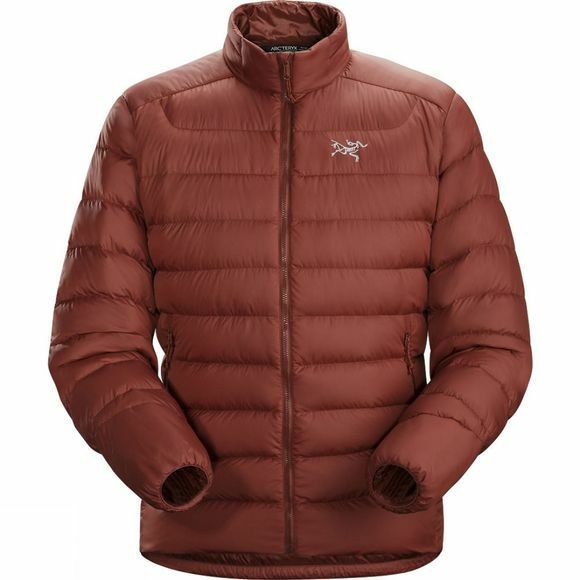 The outer fabric is soft, durable Arato 40 nylon, which is lightweight withstands abrasion, packs compactly and has a DWR finish to repel moisture. Down Composite Mapping technology combines the goose down insulation with panels of Coreloft synthetic insulation in areas prone to moisture. Used in the collar, cuffs and under the arms, the Coreloft insulates even if wet. Down is used in the sleeves and around the core. The tall collar seals out drafts, and two zipped pockets secure small essentials. The jacket's athletic fit is streamlined and layers easily under a hardshell in cold conditions. Articulation built into the sleeves and gussets under the arm provide a level of freedom of movement not often found in an insulated jacket. Because the jacket is intended as a mid layer, a sewn through construction has been used to further reduce weight and increase packability.